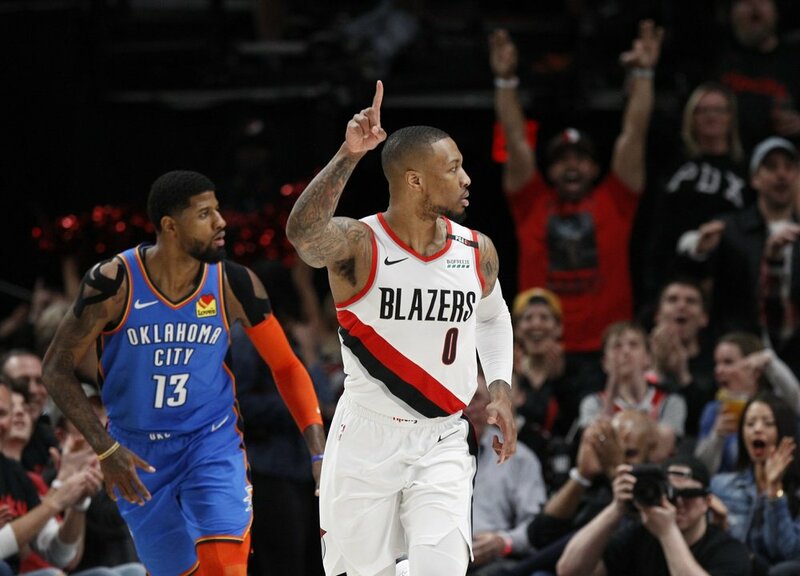 Portland Trail Blazers guard Damian Lillard, nails a basket as Oklahoma City Thunder forward Paul George, left, trails the play during the first half of game 1 of a first-round NBA basketball playoff series in Portland, Oregon. Portland were swept by New Orleans last season and the Warriors the year before. After trailing by 19 points in the first half, Oklahoma City pulled within as 93-92 on George’s 3-pointer with 2:44 left. Lillard answered with a long 3-pointer to keep the Blazers ahead and Al-Farouq Aminu made free throws to extend Portland’s lead to 98-92.